Generally, I avoid harsh acids like the plague. My sensitive, frail skin time and again has been burned and sensitized by strong acids so I typically opt for physical exfoliants, like this one from Tammy Fender (LOVE) or the Ayuna Essence (which I review down below). 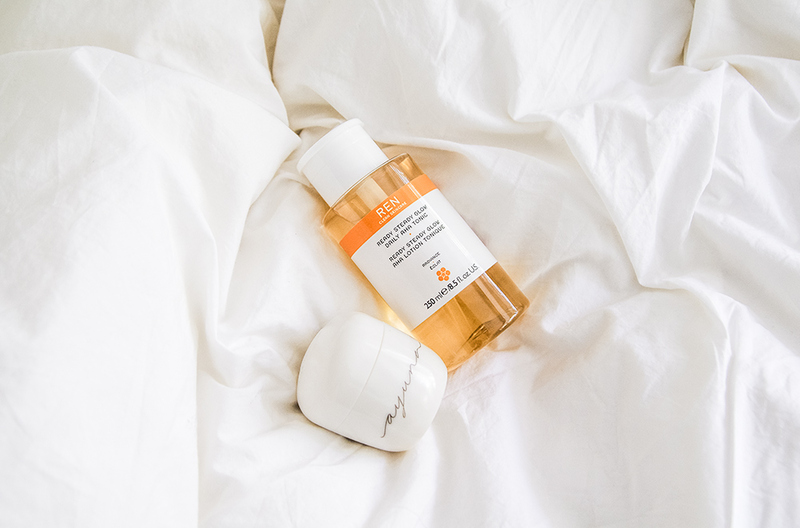 BUT last night, fed up with the persistent little clogged bumps on my cheeks and forehead, I decided to give the AHA/BHA REN Ready, Steady, Glow AHA Daily Toner a go (gasp!). At first, I was scared, fearing the worst. The REN toner is the type of product, usually sent to me by a PR rep, that sits and collects dust in my bathroom cabinet never to see the light of day. But reading up on the product ingredients piqued my curiosity. While the ingredient list reads like a tongue twister, most of the ingredients are surprisingly naturally derived. And there are no harmful ingredients, like parabens, petrochemicals, sulfates, synthetic colors, synthetic fragrances, synthetic AHA/BHAs or phthalates. So, after seeing this I decided to give it a go. I first used the Ayuna Essence exfoliating gommage peel and followed it with the REN Ready, Steady Glow toner. The results: I woke up the next morning with the SMOOTHEST skin ever. No irritation, no redness, no inflammation breakouts, nothing – except smooth, bright, decongested skin. I’m still stunned, but also ready to recommend this exfoliating duo to all my sensitive skinned ladies out there! Read on below for my in-depth review of the Ayuna Essence and the REN Ready, Steady, Glow Daily AHA Toner. How to use: This exfoliating gommage peel applies as a creamy paste. Wait 2-5 minutes, then gently rub/massage product in a circular motion causing the product to roll off the skin and release an oil finish. Review: I waited too long to remove this mask – 10 minutes or so. This caused the mask to dry too much, which made it very difficult to rub off. I ended up having to wash the remaining off with water. As I massaged the mask off, the micro-granule feel created a fine abrasion stimulating blood flow to my skin. My cheeks turned a little pink from all the rubbing. A small amount of oil was left on my skin after I finished rubbing the peel off. My skin was smooth, silky, and decongested skin immediately after using! While I loved the results after one use, one thing to note about this product is that it contains sodium hydroxide; this ingredient in high concentrations has been found to be a skin sensitizer. I personally, did not experience any sensitization from using this product one time, but I would be sure to use this product sparingly (no more than 1x a week) to make sure you don’t over sensitize your skin. This ingredient kind of reminds me of sodium bicarbonate (baking soda), another popular skincare ingredient that is highly alkaline, like sodium hydroxide, and used as an exfoliant in skincare masks, like May Lindstrom’s The Clean Dirt. Both ingredients if used too frequently, can dry out and sensitize the skin. Overall, I liked this exfoliant, but while it worked really well for me this one time, I have to tread lightly with alkaline ingredients like sodium hydroxide. And the price does seem a tad painful. – Heptyl Glucoside: sugar derived surfactant that cleanses skin and also reduces inflammation and itchiness. – Potassium Azeloyl Diglycinate: derived from azelaic acid, AA is found in grains and produced by yeast, brightens skin tone, antioxidant, reduces production of keratin, reduces inflammation. How to use: After cleansing, saturate a cotton pad and swipe across skin. Follow with hydrating components of skincare routine. Review: This review may be a tad premature, since it takes about 30-days to see the true benefits of exfoliating/brightening acids, BUT I just couldn’t help myself. I used this toner last night and am so impressed by (a) the fact that my uber sensitive skin tolerated it and (b) my skin appeared less congested the next morning! The scent is a tad strong, but I don’t mind the citrus oils; they help promote brightening and cell turnover, so I’m okay with them. I’m also very impressed by the ingredients in this toner! It’s nontoxic and safe for sensitive skin! Winner in my book. The product says that you can use this morning and night, but I’m starting out slowly and just using it at night.